Made for iPhone (6) ? Signia is among the most popular brands at ZipHearing, and for good reason. No other company brings more history, sets higher standards, or packs more technology into its hearing aids. Formerly known as Siemens, Signia represents the future of a company that began producing hearing aids more than a century ago (Sivantos). Siemens had (and still does) a reputation for what the company describes as cutting-edge technology with German engineering and premium quality. Now under the Signia moniker, the company has kept its robust portfolio of cutting-edge hearing aid technology while introducing a new emphasis on personalized hearing care. Keep reading to learn more about what this means. Signia's brand-new Pure Nx hearing aids should be on your short list if you like the sound of a hearing aid designed to enhance speech understanding in background noise while maintaining a natural quality for your own voice. We realize that every company seems to make this promise, but Pure Nx is one hearing aid that fulfills it better than many others. We also recommend the discrete instant-fit Silk Primax CIC, Cellion Primax with Lithium-ion rechargeable battery, and custom-built Insio Primax hearing aids from Signia. Most of these hearing aids come in several different styles and performance levels, so you are sure to find a combination to suit your needs. As you delve a little deeper into the options for Signia hearing aids, you may find it helpful to know that a simple numbering system designates the performance level of each model. The higher the number, the higher the performance level. The abbreviation following a performance level signifies which product family the hearing aid belongs to. For example, Pure Nx hearing aids come in 3Nx, 5Nx, and 7Nx models, so if you are looking for the top-of-the line check out Pure 7Nx. If you are looking for the latest technology Signia offers, but with a smaller price tag, consider Pure 3Nx instead. Some models include the battery size in their name (e.g., 13 or 312), when the hearing aid comes in different styles or with a choice of battery sizes. In the sections below, you'll find information on Signia's current and most popular hearing aids models, along with pricing and feature information so you can determine which Signia hearing aid is appropriate for you. If you're simply looking to get your Signia hearing aids repaired, or looking for Signia parts, like wax filters or domes, feel free to give us a call and we'll point you in the right direction. Otherwise, feel free to review the popular models below, and at the top of this page you'll find links to each Signia hearing aid model, along with prices, features, and online ratings, and more in-depth Signia reviews on each product page. Signia calls Pure Nx hearing aids the "smallest solution for a natural sounding own voice and direct streaming". This refers to the version with size-312 batteries. 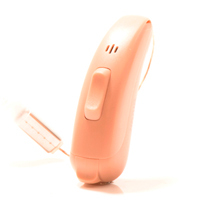 The hearing aids are also available with size-13 batteries for the longest streaming time in class. These fully-featured RITE-style hearing aids feature a raft of sophisticated sound processing technologies, including Signia's unique OVP (Own Voice Processing). If you have worn hearing aids before and had to compromise between setting the volume loud enough to hear other people's voices yet soft enough to keep your own voice sounding natural, you will probably appreciate OVP. It uses real-time recognition of your voice to process it separate from other sounds and voices. In other words, the hearing aids treat your own voice in a distinctly different way, as if you had two separate hearing aids - one for your own voice, and one for other voices. No compromises needed! Pure Nx hearing aids are made for iPhone, meaning they can stream music and calls directly from Apple devices without the use of additional accessories. For streaming from Android devices, you will need the StreamLine Mic (which is also compatible with Apple devices). It’s small, easy-to-use, and is useful with or without a smartphone, because it functions as a remote microphone for meetings or lectures where you need to hear from across the room. Of course, there is nothing wrong with using your phone the old-fashioned way – by holding it up to your ear. If that is your style, Pure Nx is still a great choice, because the full-bandwidth link between the two hearing aids transmits the phone signal wirelessly from one hearing aid to the other. Signia’s myControl app lets you discreetly and conveniently control your hearing aids from the palm of your hand with compatible Apple or Android devices. You can use it to control more than just the basics, such as left and right hearing aid volume. For example, the app lets you adjust the hearing aids' sophisticated directional microphones for improved hearing in background noise. Hearing aids with directional microphones usually focus in front of the listener to reduce interference from background noise coming from other directions. This is fine most of the time, because people tend to look at each other when they talk - but not always. What if the sound you want to hear is not right in front of you? Some advanced digital hearing aids, including Pure Nx, automatically shift the direction of focus to follow voices as the people around you move. But Signia has taken things a step further by letting you manually "steer" the microphone response in any direction, including behind you. If you're wondering how this could be useful, just think about having a conversation while driving your car. You can tell these hearing aids to “look” toward the passenger side or rear of the vehicle while you keep your eyes on the road. We mentioned earlier that Signia has introduced a new emphasis on personalized care. One example that shows in Pure Nx is how your hearing care provider can adjust them remotely, saving you the inconvenience of returning to the office for fine tuning. You can send feedback to the provider, ask for assistance by video chat, and even request minor adjustments remotely - all from the myHearing app. You want to experience superb sound quality, industry-leading noise reduction, made-for-iPhone Bluetooth connectivity, and fully automatic hearing that adjusts based on where you go as well as the sounds around you. Other hearing aids make your own voice too loud – and it drives you crazy. Signia’s Silk Nx are small, discreet, instant-fit hearing aids with superior sound quality. That's a unique combination, because these are the only invisible-style hearing aids with premium features like Signia's Binaural OneMic Directionality that also come ready to wear. Previously available only at the highest performance level, OneMic Directionality is now included in all Silk Nx hearing aids. Another new addition that comes standard is TwinPhone, which uses Signia's HD e2e wireless capability to automatically transmit phone audio from one hearing aid to another so you can hear in both ears. Silk Nx feature a soft and flexible silicone sleeve that conforms to your ear canal for a precise instant fit. This means you don't have to wait for custom devices to get a comfortable fit. The replaceable silicone sleeve simply clicks onto the tip of the hearing aid, so it's easy to get the right fit with minimal fuss. Many people actually prefer these Click Sleeves over custom hearing aids. While the Nx platform is new to Silk hearing aids, the Click Sleeves are not. It's a form factor that proved popular and comfortable in Silk primax, the predecessor to the new Silk Nx hearing aids. What has changed is that Silk Nx are 20 percent smaller than their predecessor, for even more discretion. It's enough of a difference that Signia has added one additional size (smaller) to the line up. Silk Nx not only feel comfortable to wear, they sound great too, thanks to the advanced sound processing of the Nx platform. A key feature is Signia's Ultra HD e2e processing. It's a full bandwidth wireless connection that can transfer audio and data between a pair of hearing aids. This makes it possible for two hearing aids to work together for more effective noise reduction than is possible in independent hearing aids — and it makes a big difference. When invisible-style hearing aids first hit the market several years ago, consumers loved their small size and the natural sound quality provided by having the microphones located in the ear canal. But those hearing aids were too small to house the dual microphones essential for advanced directional processing, so slightly larger behind the ear hearing aids became more popular. With Signia's Binaural OneMice Directionality, the situation has changed. Each Silk hearing aid has only one microphone, but the two hearing aids work together to provide effective noise reduction and directional hearing without adding bulk to the hearing aids. Signia Silk Nx come in three performance levels, to suit a variety of needs and budgets, and are suitable for up to severe hearing loss. If you need more power or are interested in Signia’s unique Own Voice Processing, consider a RIC hearing aid such as Signia Pure Nx. Otherwise, Signia Silk Nx are a great choice. You want the only nearly invisible hearing aids with ear-to-ear wireless and an instant fit. You have no usable hearing in one ear, and want a wireless CROS system for streaming audio from one ear to the other. You prefer invisible-style hearing aids, but dislike the feel of acrylic or other hard materials used in custom hearing aids. Cellion Primax hearing aids are RITE hearing aids with a rechargeable Lithium-ion battery. They are built on the same technology as the Silk Primax models, so they are compatible with EasyTek wireless accessories, the touchControl smartphone app for Apple and Android devices, and can stream telephone signals from one hearing aid to the other via a wireless connection. Unlike Silk Primax, Cellion Primax also include directional hearing aids for improved hearing in background noise, and a push button for manual control. The battery lasts 24 hours per charge, with unlimited audio streaming from the EasyTek remote control. Unlike some competitors' rechargeable hearing aids, Cellion Primax uses inductive charging. This means the battery is enclosed in the case, with no battery door and no electrical charging contacts. Simply place the hearing aids in the charger and you're done. Ultimate simplicity is your goal. Rechargeable batteries with inductive charging, IP68 water resistance, and one-button control make this reliable hearing aid hard to beat for ease-of-use. Signia's Insio Nx are small, discreet, custom-fit hearing aids with superior sound quality. 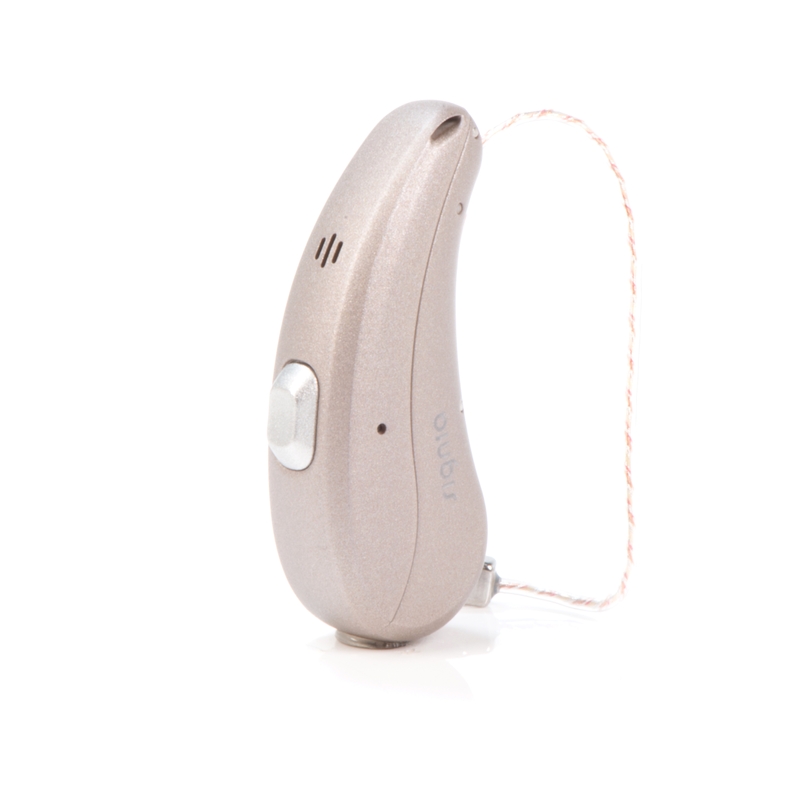 The highlight of these sophisticated hearing aids is Signia's Ultra HD e2e processing. It's a full bandwidth wireless connection that can transfer audio and data between a pair of hearing aids. What this means is that the two hearing aids can work together to reduce background noise, provide enhanced directional hearing, and improve music processing. When invisible-style hearing aids first hit the market several years ago, consumers loved their small size and the natural sound quality provided by having the microphones located in the ear canal. But those hearing aids were too small to house the dual microphones essential for advanced directional processing, so slightly larger behind the ear hearing aids became more popular. With Signia's Binaural OneMice Directionality, the situation has changed. Even though Insio hearing aids each have just one microphone, they can work together to provide effective noise reduction and directional hearing without adding bulk to the hearing aids. Previously available only at the top of the Insio line, this feature now comes standard in all Insio models. TwinPhone, another new addition included in all Insio models, uses Signia's HD e2e wireless capability to automatically transmit phone audio from one hearing aid to another so you can hold the phone to one ear, but hear call in both ears. 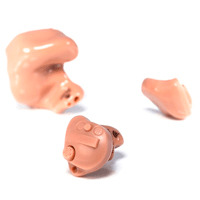 You want a custom in-ear hearing aid with a wide selection of styles, features, and performance levels - and plenty of power for fitting up to severe-to-profound hearing loss. You would like your hearing aids to include built-in therapeutic sounds for tinnitus relief. You would like to be able to control your custom hearing aids with a smartphone app, without the need for an additional streaming device. VERIFIED BUYER | Kenosha, WI	? I am a first time hearing user and I have had the Signia Silk 7nx aids for about a month. So far I am very pleased with them. They are very comfortable and provide good sound quality for me. I have noticed a much better ability to hear in background noise situations. They fit well and with the phone app. I can adjust them to different situations. I would recommend them to those looking for an in the ear device. VERIFIED BUYER | Camden, SC	? The sound quality is clear and easy to understand. These aid fit nicely in my ears and I dont worry about them falling out. They are easy to put in and take out. The only problem is the arm on my glasses sometimes get in the way. I can usually adjust the aid to fit more comfortably with my glasses so it's not a big problem. VERIFIED BUYER | Wyncote, PA	? The sound quality is good. They are comfortable but while the volume is louder, I am still having trouble making out the words. I had another adjustment today and have another appointment in a few days. I hope they can be adjusted so that I can really hear better. I have saved up in order to buy hearing aids and I hope that I don't have to return them. VERIFIED BUYER | Mohegan Lake, NY	? First-time hearing aid wearer here. I have had my Signia pure 7N 312 cros hearing aids for almost two weeks now and have been very happy with their sound quality and function. I have been single-sided deaf for about twelve years. Now, when I take these out at night, I realize how much I had been missing all those years. They are discreet enough to be barely noticeable, blend and fit well with my glasses and the receivers in canal fit comfortably. Though I have nothing to compare it to, the own-voice technology seems to be working well. My voice seems perfectly natural to me. The aid syncs seamlessly to my iPhone when I take calls or listen to podcasts and those on the other end of the call hear no difference. So far, I haven't had any of the problems with the My Control app others have mentioned and like the fact that I can increase the bad-ear mic volume through the app. This comes in handy in the car to better hear the person sitting next to me. The only downside I've noticed with these aids is that when I'm outside in the wind I do get a slightly annoying wind rustle. (This may be coming from the cros mic for my bad ear.) I plan to mention this to my audiologist to see if this can be corrected. In the past, whenever I went out to a restaurant, I would always have to assess the room and pick the best seat to compensate for my single-sided deafness. Not any more. Just last night when my wife and I went to the local diner, I purposely picked what I thought would be the worst seat and was pleasantly surprised to find I didn't have to strain at all to hear what the waiter or my wife was saying. VERIFIED BUYER | Powell, OH	? I found them easy to adjust to. Not really noticeable feeling wise when in my ears and they are so light they don't put any weight on my ears. Sound has been good. I'm hearing a few sounds that I was missing before and apparently hear people around me better. The sound itself seems true as I compare it to what I heard before the hearing aids. Don't notice any difference in the sound of my voice with them on. The charging system is convenient. I've had no problem going 17-18 hours in a day with charge still left. VERIFIED BUYER | Peoria, AZ	? Sound quality is better than my previous hearing aids ... but still not where I would like them to be. Still in adjusting phase, I hope I can reach a better natural sounding point. Overall they are better than the other 3 attempts I have tried with other manufactures .Some of the cons are music sounds very different than original soundd ... also hard to hear distinctively behind me. I hear the person but have difficulty with clarity understanding. VERIFIED BUYER | Jersey City, NJ	? The devices do not work for me as they do not fit securely in my ear canal. More noise amplification than speech clarity Squealing when I have my mobile phone or handset to my ears No invisible enough compares to soundless which I previously wore. Interface with app worked fine but sometimes is hesitant in connecting with app . I’m very happy with this hearing aid. It is my first one but the hearing improvement it has given me is remarkable. I have an iPhone so I’m enjoying the streaming ability that is available to me. Unfortunately my son, who just got these hearing aids as well, has an Android and cannot use the streaming feature with his phone. This is the only improvement I would request that they work on because this is such a helpful feature, I feel like he isn’t getting the full benefit of these hearing aids without it.